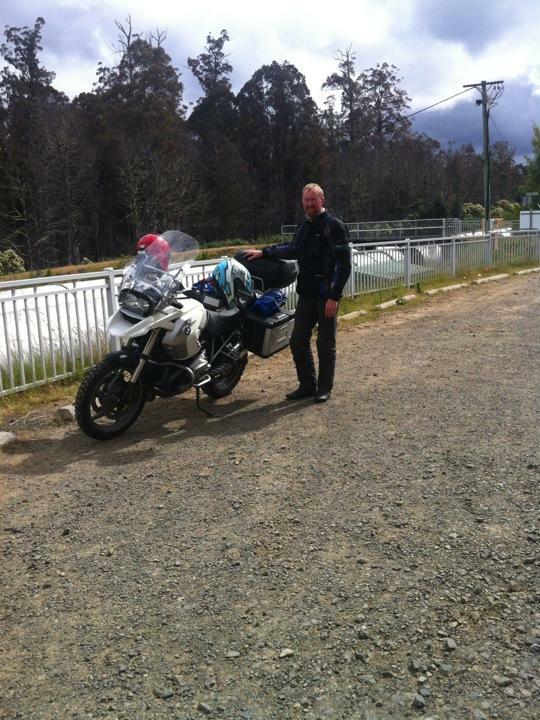 Blog from Derwent Bridge, Tasmania | Where's Jeff? We made it! To see the yachts come in that is, we stood on Battery Point about 150 meters from the Sydney to Hobart race finish and watched the line honors winner cross the line sailing right at us. Sandi got soaked by the spray from the wake of spectator boats hitting the sea wall in front of us. We really had the complete experience. we spent two nights camped at the show grounds in Glenorchy, the other campers were friendly as usual but the road nearby was a bit noisy. We wasted no time in rising to the top of Mt Wellington, taking a few pic's and freezing some parts of Sandra. There is a shelter at the top of the mountain that was not there on my last visit but the same old plaques were there enjoying their new indoor setting. Called my old mate Jim from the top, Jim was there with me last time. Hobart kindly put on a taste festival for us (apparently Tasmania's largest annual event) and we got right into it - don't know what everyone else ate! We generally enjoyed Hobart and climbed the Shot tower on our way out of town - if you travel this way newer the Devonshire tea and scones - they are addictive. Riding south to Geeveston the weather stayed fine and the scenery was coastal rural and beautiful. After a very late lunch at the Country cafe we rode toward Tahune Airwalk. Hoping to find a campsite in the tall timber we were not disappointed and settled into our site with enough time left to complete one of the walks before dinner. Our Trangia dinners are getting better but we could not resist the temptation of breakfast in the insure cafe next morning. The Airwalk was great fun but I Enjoyed the swinging bridges walk better - make sure you walk it when you're down that way. In true Douglas-Hortin style we left Tahune at 3.30pm and thought we would go to Richmond (north of Hobart) via the Channel Highway (the longer but more interesting road of course) that afternoon. We were making good time until Sandra was distracted into a roadside cherry shop Alan's couldn't leave before consuming the entire bag of cherries we bought! Back on the road we had no sooner passed the shot tower again when the figure of a lovely young woman walking towards us seems to have claimed the attention of an elderly gent driving toward us an he promptly turned right, across our path without warning. I breaker heavily and fortunately so did he after he notices us (he locked up a wheel or two) and a collision was avoided. I was not carrying excessive speed but nevertheless he was very close when he made the turn and I'm not sure I could have missed him had he not stopped. Richmond is a pretty little boutiquey sort of town. I tire of such towns fairly quickly but they're always nice for a start. We rolled into town around 7.00pm on a holiday weekend and thought we might book a room for a change. - No chance! In fact it looked like even the campground was booked out until we passed he gate of Hatchers Manor which displayed a 'vacancies' sign. After safely negotiating the motorcycle repellent driveway paving we snuck past the resident lion and met the most helpful inn proprietor we have experienced in years. After confessing the sign was incorrect because they did not have a 'no', Jeannette kindly allowed us to erect the tent on the lawn and use the bathroom, laundry etc before sitting down to dinner in rtheir restaurant. Today is the end of 2012 and we are holed up in a chalet at Derwent bridge. It's a bit cooler here than it has been elsewhere and we thought we would give ourselves a treat with a room for the last night in 2012. It's been a pretty good year for us and we're still out here having fun so we will stop here tonight and reflect a little.